Decluttering………..it seems easy at first, but then you discover challenge after challenge. Memories and sentimentality get in the way of discarding things that have long been forgotten. Progress slows as we begin to find reasons to keep stuff. I have been listening to a Podcast that has really helped me to get my head on straight when it comes to decluttering. It has really motivated me to continue to declutter. The Podcast is from Julie Coraccio who is a lifestyle coach and professional organizer. You can find her at Reawaken Your Brilliance. Her Podcast, “Clearing the Clutter Inside & Out” really gets to the heart of the problem of decluttering. She discusses the reasons we hold on to things and strategies to get to the heart of our clutter problems. As I have worked on decluttering my home, I have come across boxes and bags and shelves full of items that I know I no longer use. As I look at these items, I have realized that I am holding on to my past life. Rather than discarding items that no longer fit with my current lifestyle, I have been holding on to them. I don’t have a large home so holding on to things that are never going to be used certainly is not a good idea. Decluttering often comes in “stages”. You declutter the easy stuff first and pass over items that are mentally more difficult to part with. There are a variety of reasons decluttering is mentally difficult. One hot button for me is my sentimentality. I love to sit and touch old items and relive memories that are associated with those items. To some people this may sound quite silly, but for me and many of you this is our reality. Thanks to Julie, I have some coping skills to work on some of my clutter. Today, I am going to share some of my hot button items as a way to create awareness. As we bring the clutter out into the light, we are then better able to deal with it. You and I deserve the freedom that a clutter free home brings. Day by day we are chipping away at the clutter. Our homes didn’t get cluttered in a day so it’s going to take some time to declutter our homes. Don’t give up. We can do this! 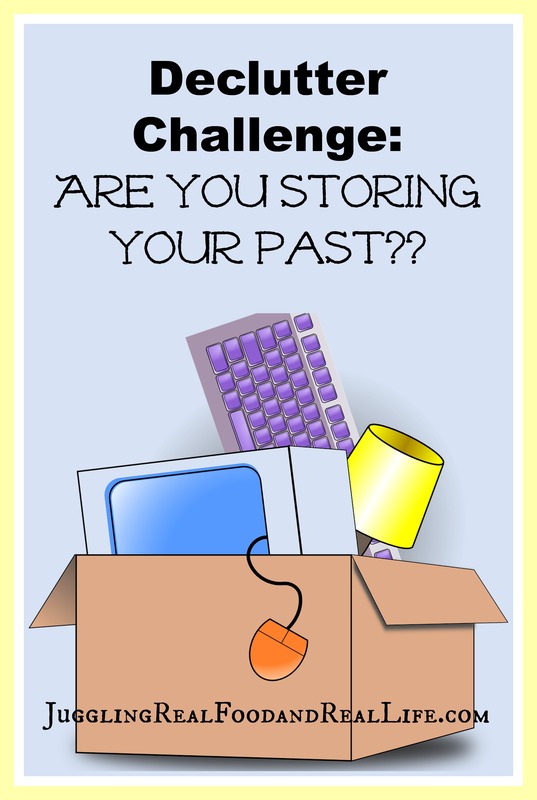 Are you storing your past?? Moving: Holy cow! I have a ton of stuff that I moved from house to house that I no longer need. Items I never even took out of the boxes. Instead of parting with these items, I stored them all away. That’s nuts. Time to part with the curtains that only fit the window at my old house. Have you moved and stored items away? Changing Décor: As times change, so does my taste in home décor. What was on trend 10 years ago is now my current clutter. I keep thinking that I will find some new use for items or they will be popular again, but the truth is……..even if I would use them again……….I would never be able to find the items. My home does not have an entire room for organized home décor items so my old stuff has to go. Have you changed your décor and stored items away? Kids Getting Older: This is a tough one for me. I feel like I am getting rid of their childhood. Unfortunately, kids grow up whether I want them to or not. I have recently discovered that two of my kids are way less sentimental about things that I am. They see no reason for us to hold on to their old toys, books, and clothes. They are also very quick to toss memorabilia items. My other two kids are more sentimental and one borders on being a hoarder. He is tough. I will focus my time on purging items for the two that are less sentimental. I probably don’t need my 9 year old’s toddler size bathing suit anymore…..no matter how cute it is. My non-sentimental children are teaching me quite a bit with their logic about belongings. It’s a different way to think about things. Have your kids gotten older and you stored their items away? Change in Interests: As times change, so do my family’s interests. I still love to scrapbook, but I don’t have much time these days for other crafting. Time to get rid of some of those old craft supplies. Sure, I would love to craft more, but my current reality is that there is no time for this activity. I would rather spend my time watching my kids play their sports. Don’t bowl anymore? Probably don’t need the ball and shoes anymore. Do you store items that you no longer use because of a change in interests?? Job Change: Often with a change in work, comes a change in clothing needs. When I changed jobs, I went to work at a less formal office. I still wear skirts, but I haven’t worn a jacket in years. Now I look in my closet and think, “Even if I changed to a more formal office, I wouldn’t wear those jackets.” I know me………I would just buy new. Are you storing items that you no longer need due to a change in employment? Buying New: I am so guilty of buying a replacement item and then holding on to the old one “just in case.” Just in case what? Just in case, I want to use a crappy old item that doesn’t really work or meet my needs? I don’t think so. It is better to part with the items then to hold on to them. I don’t need three blenders, four dingy white shirts, or shoes that have seen better days. I am now trying to stick with the one in one out rule. Do you buy new items and then store the old ones? Don’t get hung up on who gave you the items that are now your clutter. That is often the burden of sentimentality. Focus on making sure that you only hold on to things you absolutely love and use now…………..not in the past. If it doesn’t meet these parameters then you need to find the items a new home. A clutter free home is our goal. What problems do you run across with decluttering? What advice do you have to offer others who may be struggling with decluttering and organizing their homes. For more decluttering tips check out the Freedom From Clutter in 40 Days series by clicking the image below. These are awesome tips, Christina. I have some work to do in some of these areas! I’m afraid that holding on to multiple of the same items is one of my worst habits. Just last night I said to my husband……..”should I toss these old sneakers or hold on to them just in case?” I’m working on it! Change is certainly slow. I can so relate to this. Great post. I bet a lot of people can relate to this post and you and I are more the norm than those with completely clutter-free homes. I hope that my writing results in some homes being blessed with some long overdue decluttering. I have one year left of homeschooling, only 3 classes so this month I have been decluttering homeschool books and supplies. It feel so good to let go of it all. I am a book lover so it felt hard, but boy does it feel great when it is gone and I have more space. I do find though I have to be in the mood, meaning if I am being overly sentimental, decluttering doesn’t work well. I bet you have tons of materials Karen. Being in the right mood is so important to me too. Otherwise, nothing gets accomplished. I am way too sentimental for that. I hate clutter, but I can’t seem to get rid of it! I’m a sentimental keeper of things for sure. The kids are away for a few days so I’m hoping to get some tidying/purging done over the weekend. Thanks for the tips – it should help me think through all our stuff rationally. I certainly know how being sentimental can really slow the declutter process down. I still have my children’s teeth (from the tooth fairy) in my sock drawer. Uggh!! I’m also a scrapbooker so I keep lots of memorabilia. When I put those sentimental feelings away, I really enjoy the extra space I gain from decluttering. I feel like I can breath better with less clutter. I am glad you said that you declutter the easy stuff first and pass over items that are mentally difficult to part with. I was cleaning my home when I realized I needed to declutter and heal my past life. Thanks for the tips on mental decluttering.